The BSA Meteor is a full power, break barrel spring air rifle, primarily designed as a hunting rifle thanks to its robust and reliable action, and fast handling beech stock. The air rifle features one of BSA cold hammer forged barrels for fantastic accuracy and consistency, which is coupled to BSAs ABT safety system which locks the barrel down, and prevents the rifle from being fired whilst it is open. This ensures complete safety whilst reloading. The Beech stock is ambidextrous and very comfortable to hold with checkering to the pistol grip and forestock for a fast handling hold, which is necessary in a hunting situation. 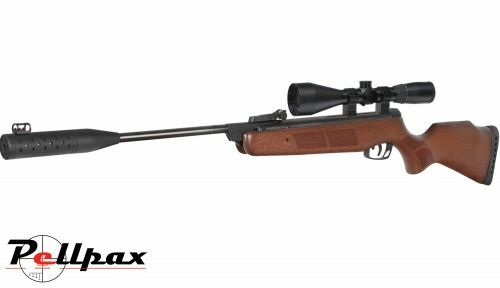 This air rifle is also featured with BSAs new Silentium silencer technology, which is a permanent muzzle break on the end of the barrel to dramatically reduce the barrel report. Sights - Adjustable Fibre Optic.